There are times when the thrift gods bless you with a gorgeous print skirt and then you try it on and discover it doesn't fit the waist. Sometimes it's just a little tight. Sometimes it just doesn't fit! Were the waistlines smaller in the 80s? Was the shapewear better? I bought my precious print skirt anyway because..I'm going to lose weight..have my tummy tucked..not eat for the day and other such lies I tell myself. A year later and the game plan is slow going. Luckily there's another option! DIY. I cut that mothereffin' tight waistband off and added an elastic waistband. 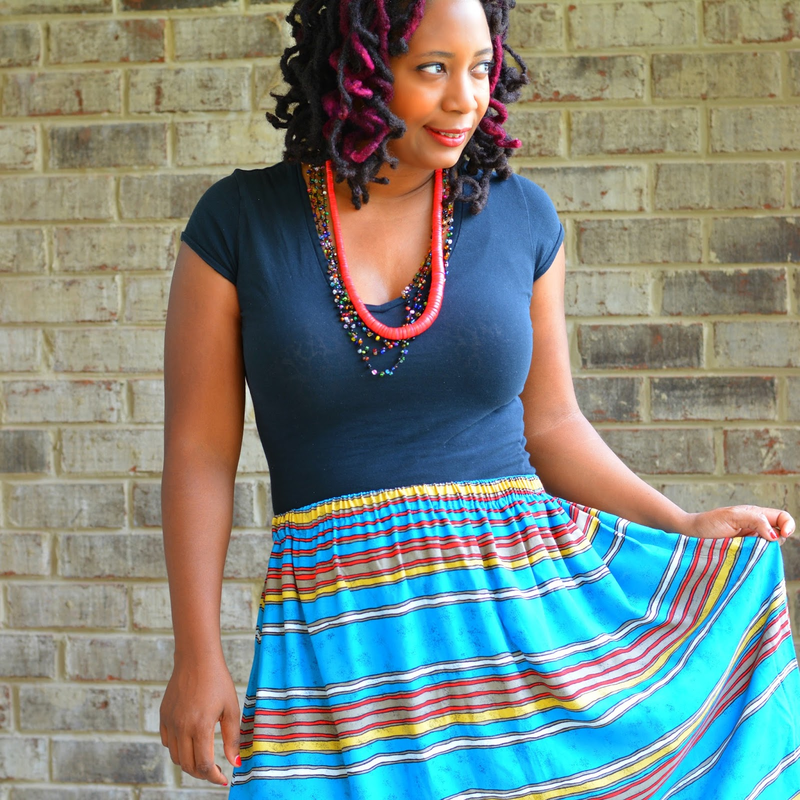 This pattern has nice horizontal stripes to make the refashion super easy. 1. Remove the zipper. Even if you don't sew, the seam ripper is your friend. It's sew (hee hee) friggin handy. 2. Sew a new seam. Easy enough to do. Just follow the seam line below the zipper. 3. Cut away the offending waistband and any additional fabric that doesn't ease over the hips. I mostly eyeballed it. 4. 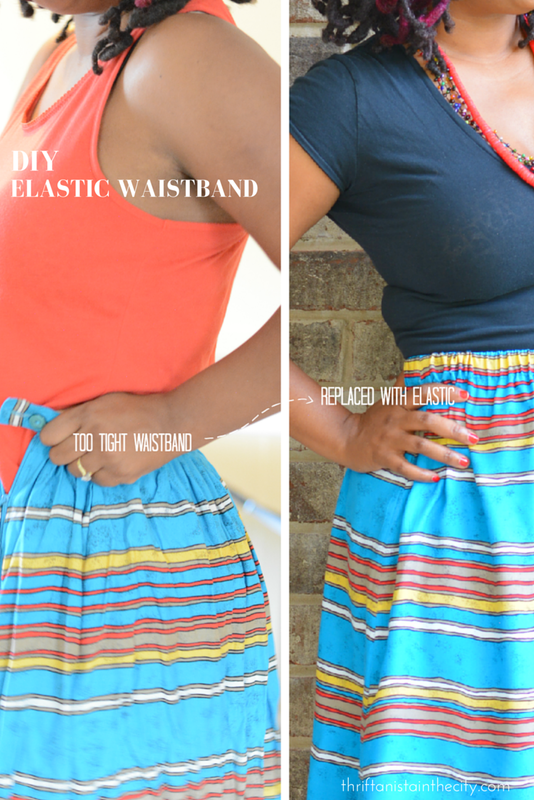 Measure your waist with the elastic. Make a casing. I used 1" elastic. My casing was 1.25 inches so that I could comfortably insert the elastic and sew close to the seam edge. Don't forget to leave a couple of inches open for the elastic to go in. 5. Insert elastic. Sew the opening close. Now I have a new old skirt. 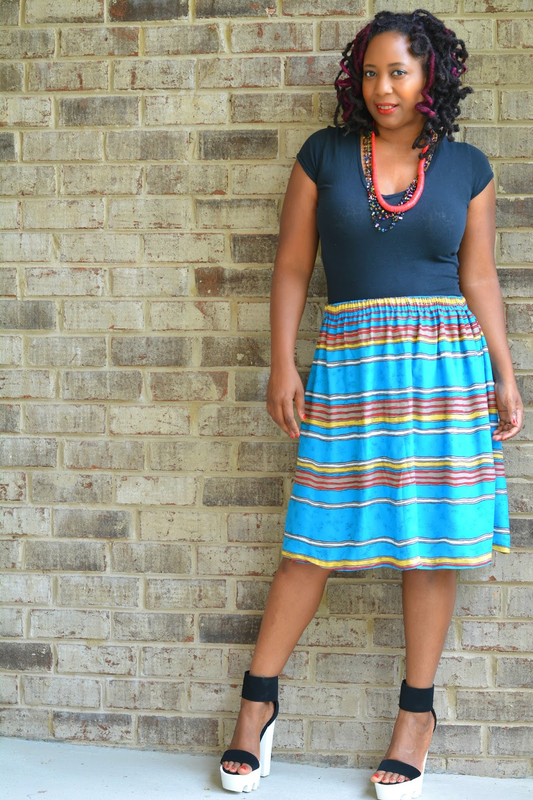 Vintage skirt fits the waist perfectly without losing weight! To reward myself for finally fitting into the skirt I wore it with my latest shoe purchase. I have been wanting to try lug sole heels for a while but they seemed so impractical and I was right. They are. They are the highest heels I own. Fairly comfortable but high. Strictly for sitting around a hookah and a cocktail. And snacks because this skirt was made for it. Are you having a similar issue with vintage skirts? I think the elastic waistband may actually look better. It looks like a dress. Really cute. And yes, of course I have that same issue with vintage everything. genius! 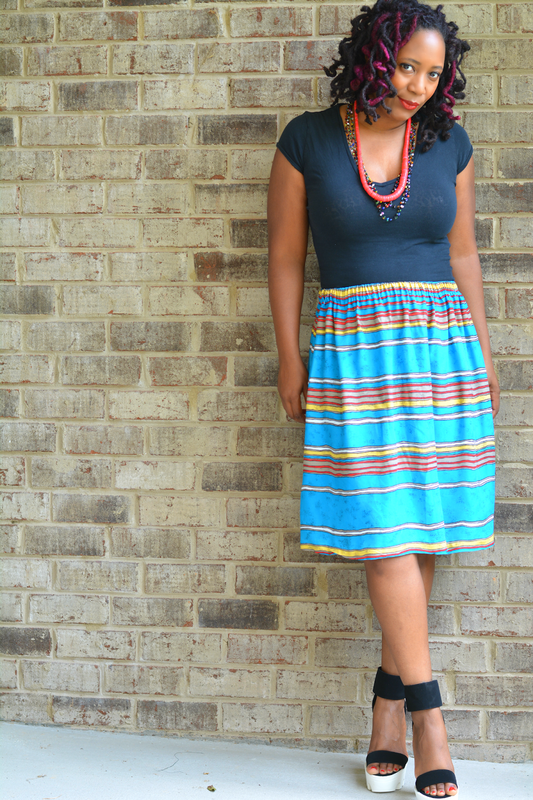 i have a few skirts that i've thrifted that don't fit in the waist, but i can't seem to let them go. thank you for this tutorial! This is a great tutorial! I'd probably have a lot more skirts in my closet if I'd thought of this! Great post! This is genius! I just wish I could sew. Last year I bought about 12 vintage wool skirts while thrifting. Not on would zip comfortably. Now I have a plan...after I find a tailor. Thanks!